DOYLESTOWN (PA) – Delaware Valley University will look to clinch at least a share of the Middle Atlantic Conference (MAC) championship when the undefeated and fifth-ranked Aggies travel to Misericordia University on Saturday, November 4. Kickoff at Mangelsdorf Field is set for 1 p.m.
DelVal upped its record to 8-0 overall and 7-0 in the MAC following its 35-0 shutout of Lebanon Valley College last week. The Aggies are one game ahead of archival Widener University (6-2, 6-1) in the conference standings with two weeks remaining. A win at Misericordia would give the Aggies a share of the MAC title. 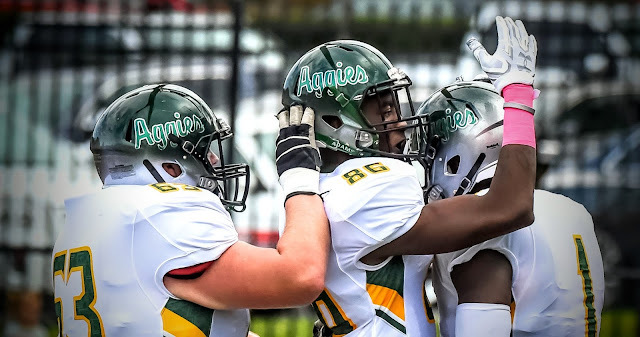 A DelVal win and a Widener loss at home to King's College would give the Aggies the outright title and the conference's automatic berth to the NCAA playoffs. If both teams win or lose this week, their annual regular-season finale will take on greater meaning as the MAC championship and national tournament berth would be on the line in Doylestown on November 11. DelVal, which is ranked fifth in the American Football Coaches Association (AFCA) poll and seventh in the D3football.com poll, is searching for its seventh MAC crown (the first since 2011) and seventh trip to the NCAA playoffs (the first since 2014) since 2004. The defense is a big reason behind this year’s success. The unit is ranked fifth in all of Division III in scoring, allowing just 8.8 points per game. The group is also fourth in pass efficiency defense (83.96 rating), sixth in total defense (226.4 yards per game) and 10th in rushing defense (68.0 yards per game). Senior linebacker Nicholas DiGati (Townsend, DE/Middletown) leads the way with 57 tackles. He also has one forced fumble on the year. Senior safety and preseason All-American Shawn Miller (Laurel, DE/Laurel) follows with 42 stops. He is tied for the team lead in interceptions with three and also has a blocked punt to his credit. Senior linebacker Nick Wright (Hatfield, PA/North Penn) is actually the team’s fifth leading scorer with 20 points. He has a fumble return for a touchdown, an interception return for a score and a safety on defense and a blocked punt return for a touchdown on special teams. Wright’s other totals include 36 tackles, three interceptions and three sacks. The starting front line in the 3-4 alignment includes ends Vincent DiLeo (Philadelphia, PA/Bishop McDevitt) and Christian Snowden (Williamstown, NJ/St. Joseph Hammonton)and nose guard Marc Isaac (Warminster, PA/William Tennent). The trio have combined for 71 tackles and eight sacks. Offensively, DelVal is averaging 38 points and 416 yards (213.3 avg rushing, 202.7 avg passing) per game. Junior quarterback Dashawn Darden (Norristown, PA/Cardinal O’Hara) heads the unit and he has completed 114 of 197 passes for 1,509 yards, 19 touchdowns and just four interceptions. He has also rushed for 367 yards and three scores. Two-time all-MAC first-team tailback Devauntay Ellis (Ewing, NJ/Ewing) is the conference’s leading rusher with 835 yards and 10 touchdowns on just 141 carries (5.9 avg). He went for 137 yards and three scorers – all in the first half – in the win over Lebanon Valley last week. Junior wideout Marquis Ellis (Owings Mills, MD/Franklin) and sophomore Dan Allen (Philadelphia, PA/Penn Wood) have caught 23 and 16 passes respectively. Marquis Ellis has also netted 314 yards and six touchdowns while Allen’s catches have gone for 302 yards and four trips to the end zone. The Cougars are in their sixth year of intercollegiate competition. This season, they are 1-7 overall and 1-6 in the MAC with their triumph being a 43-14 rout of Wilkes University on September 23. They are coming off a 35-17 road loss at Lycoming College last Saturday. Offensively, Misericordia is averaging 22.1 points and 364.8 yards (149.5 avg rushing, 215.3 avg passing) per contest. Sophomore Aaron Barry is the team’s current quarterback and he has completed 30 of 54 passes for 205 yards. Junior running back Clayton Vleck has carried the ball 60 times for 277 yards and two touchdowns. Sophomore Isaiah Williams is the Cougars’ leading receiver with 50 receptions for 682 yards and three touchdowns while junior Josh Dieter has reached the end zone six times on his 24 catches. On the defensive side of the ball, Misericordia allows an average of 41.8 points and 499.3 yards (225.4 avg rushing, 273.9 avg passing) per game. Senior safety Tyler Collins heads the unit with 69 tackles. He also has one interception and two pass breakups. Sophomore linebacker Nick Yeager follows with 53 tackles to along with two pass breakups and one sack.